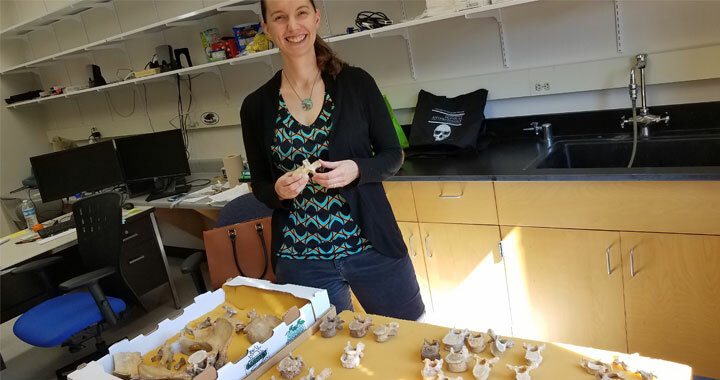 Visiting professor of Anthropology Emily Middleton examines a human vertebra in her office. Middleton is the new director of UWM’s Forensic Science program. Photo by Sarah Vickery. It’s that time of year when UWM students and faculty gather together to sit down and listen to what stories the dead might tell. But it’s not a séance – it’s science. The Forensic Science program is in full swing this semester, including the introductory course to the Forensic Science certificates, a class entitled “Dead Men Do Tell Tales.” Courses are packed with students eager to learn the basics of forensics – everything from how the Medical Examiner’s Office operates to Wisconsin’s history of serial killers. At the helm of it all is visiting assistant professor of Anthropology Emily Middleton, who is helping coordinate the program this year after former director Professor Fred Anapol retired. She sat down with Letters & Science to talk about her work. Tell us a little bit more about UWM’s Forensic Science certificate program. chemistry, criminal justice, anthropology, the health sciences –everybody working together, because forensic science is a really broad field. It’s simply the application of science to criminal investigation. Our curriculum starts by introducing students to all of the different subfields of forensic science and then lets them to specialize in one or more of the areas that they find interesting. What do forensic scientists actually do? They analyze the physical evidence collected at crime scenes. Think about how varied that’s going to be. You’re going to get anything from DNA, blood, other biological tissues, to chemicals, paints, drugs, diseases or other pathology, plant remains or bugs. That’s why you need to take this broad approach to educating students about it. We’re pulling in experts from all of these different fields and working to integrate all of these different disciplines. When you say experts, you mean academics but also professionals like medical examiners and law enforcement. We have very strong links with the Wisconsin State Crime Lab and with the Medical Examiner’s Office. We’ve had multiple students from the program working for those two institutions. That’s been a strength of the program from the beginning. Some of our courses are primarily taught by people from those institutions. For example, this spring we have a criminalistics course that’s taught by one of the members of the Wisconsin State Crime Lab. She has them do a mock-crime scene, and then a mock-trial where she has them presenting the evidence. It’s really good preparation for the actual types of things you’ll be doing on the job. With Halloween around the corner, let’s talk about what’s on everyone’s mind: How do dead men tell tales? The skeleton provides a wealth of information, beyond things like height, body size, male versus female, age. For example, your health as a child is encoded in your teeth: Times of nutritional stress will leave markers in the enamel. You can also find evidence of antemortem pathologies in bones, such as signs of arthritis or healed fractures, as well as clues about injuries that happened around the time of death. What changes would you like to make to the program? I want to work to grow this program. We’re starting small by revamping the website. We have internships available with the Wisconsin State Crime Lab and with the Milwaukee County Medical Examiner’s office, and I want to make students more aware of these possibilities. I’m working to forge new links on campus to bring in more people, more departments, to provide additional hands-on training for students or other opportunities to better prepare them for the job market. There’s some good stuff in the works to grow it beyond the ‘core’ departments. Do you think shows like “CSI” or “Bones” have an impact on Forensic Science classes? techniques is not too far off, but the time scale is off. You’re lucky to get a lot of these tests back in a month. You’re not going to be running after the criminals. You might be the one collecting the sample, but then you’re going to be working in the lab, running the tests and writing reports. That’s a big part of the job, is just writing reports. They’re not putting that in a TV show.